Savona, Italy — Building on the overwhelming success and interest generated by the First International Italian Mandolin Academy, the Second International Mandolin Academy will be held in Savona, Italy, September 9-16, 2007. 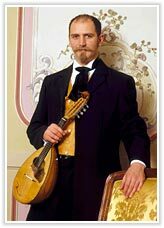 The Academy is under the artistic direction of Carlo Aonzo, acclaimed virtuoso of Italian mandolin technique. The first Academy was attended by musicians from all over the world, and the second Academy promises to offer an enhanced experience to its international students. The Academy offers a unique opportunity for beginners as well as professional musicians to learn and improve their mandolin technique. The application form for the workshop is available at aonzo.com. Savona is a small city with an ancient history. Situated in the heart of Liguria on the Mediterranean Sea, it is considered by many to be the most beautiful region in Italy. Though it is close to Genoa and its international airport, Savona does not have the chaotic environment of large urban centres. Situated on a coast famed for its beaches and typical small seaside towns and villages, against a backdrop of hills and mountains, Savona offers a natural beauty second to none. The Academy links the study of mandolin not only to regional culture, but to all the sights, sounds, and tastes that beautiful Italy has to offer the international student. English will be the official language of the Academy. Italian lessons will be available for participants and companions. Cultural exchanges between students attending the courses and the local area is fostered in ways which lead them to become not only students and tourists, but "honorary citizens" taking an active part in the city and serving as ambassadors of culture. The mandolin and other instruments in the same family are widespread in the musical traditions of many other countries. The mandolin is the instrument of emigrants, who carried it to foreign lands. Melodies played on the mandolin can be linked to their diverse cultural origins. The Academy serves to celebrate the mandolin which, through its music, has become a symbol of communion among diverse nationalities. Themed concerts open to the public are planned. During the final concert, the epilogue of the study week, the Academy students will play together with the Ligurian Pizzico Orchestra. The authorities of the city of Savona are currently organizing a visit to Savona by His Holiness Pope Benedict XVI. This important event is expected to take place around the same period as the Academy.